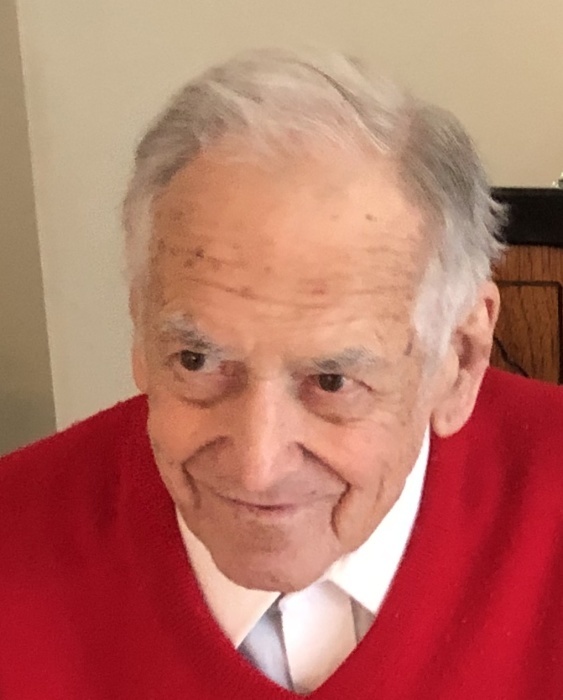 Carl Thomas Delahunty, 90, of Howland, entered peacefully into eternal life on Sunday, April 7, 2019 at 2:35 p.m. in the emergency room at St. Joseph Health Care Center in Warren. Carl was born on May 4, 1928 in Warren the son of the late Thomas Edgar and Minnie Myrtle Kegg Delahunty and was a lifelong area resident. A 1946 graduate of Warren G. Harding High School, Carl was employed as a linotype operator at the Warren Tribune Chronicle and was supervisor and vice president of Crook’s Bottled Gas Company in Cortland. He was a lover of anything with wheels from bicycle to cars. Carl was an avid vegetable gardener and traveler with his wife after retirement. He loved to tinker and repair anything that was in need of a good fix. Carl was a longtime member of St. Elizabeth Ann Seton Parish-St. James Catholic Church in Warren and was a member of the Knights of Columbus St. James Council and the Outspoken Wheelmen of Youngstown. Carl was married to the former Martha Ella Zess on August 6, 1949 in St. Stephen Catholic Church in Niles and she survives after almost 70 years. He is also survived by his eight children: Diane (Marilyn Bufton) Delahunty of Bellingham, Washington, Brian (Teresa) Delahunty of Columbus, Edward (Jerri) Delahunty of Cortland, Thomas (Lori) Delahunty of Cape Coral, Florida, Mary Sue Delahunty of Rocky River, Carla (Harry) Dawson of Rochester Hills, Michigan, Linda Blankenship of Rocky River and Laverne (Steve) Buchanan of Columbus; twelve grandchildren Matthew, Mandy, Andrew, Brent, Benn, Sean, Damicah, Kristen, Alexandra, Dylan, Joseph and Tammy; and five great grandchildren Adeline, Clara, Eleanor, Aspen and Amaia. Besides his parents, Carl was preceded in death by his sister Laverne Crooks. Calling hours will take place on Thursday, April 11, 2019 from 5:00 p.m. until 7:00 p.m. in the Staton-Borowski Funeral Home and again on Friday, April 12, 2019 from 9:00 a.m. until 9:50 a.m. in St. Elizabeth Ann Seton Parish-St. James Catholic Church. A Mass of Christian Burial will be offered with Fr. Carl Kish officiating at 10:00 a.m. Friday, April 12, 2019 in the church. Burial will take place in All Souls Cemetery in Cortland.